CAROLYN K. MOORE was born in Chicago but was raised in Tampa, FL. She attended Tampa Business College and is a registered paralegal in the State of Florida. 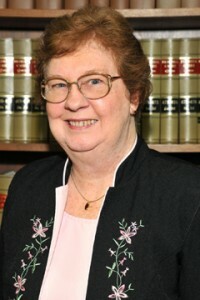 She has over 40 years of experience in all aspects of the firm’s real estate, trust and probate practice. She has been a licensed notary since 1968. Carolyn’s warmth and professionalism are a welcome greeting to our clients and their varied needs. Her experience in the legal industry, as a secretary and paralegal, strengthens the services and cost-effective results the firm delivers to clients. Carolyn lives in Seminole with her husband and mini Australian Shepherd named Panda. She enjoys spending time outside of the officeinvolved in church activities, camping, bicycling, and spending time with family.